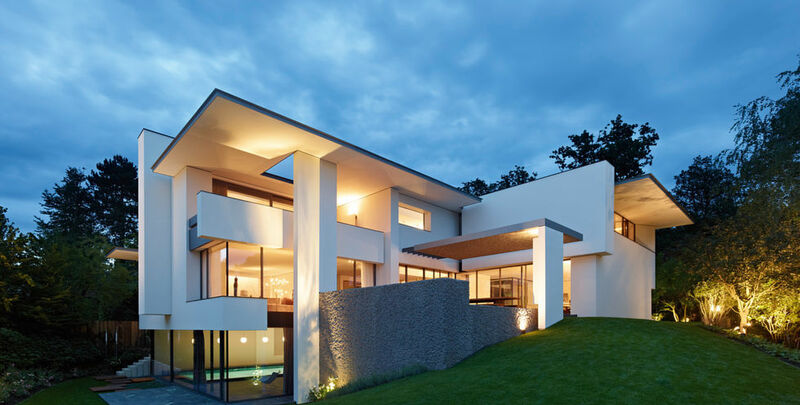 At the edge of a forest to the south of Stuttgart stands a sophisticated, three-storey flat-roofed villa surrounded by around 2,000 square metres of garden. The building looks smaller than its imposing living area of 650 square metres would suggest. Intelligent cuts into its cubes and large glazed areas prevent it from looking overpowering. 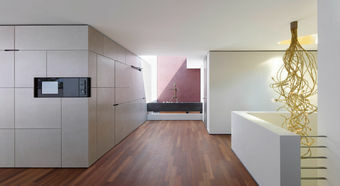 Inside too, the main living area on the ground floor looks fluid but not excessively large, due to the seamless transitions between the living and dining areas and the studio. 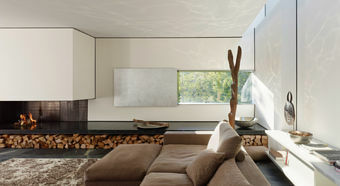 Its diverse interior design gives the living room, with its low ceiling and windows, an intimate look. Above the dining table, a gallery opens up to the upper floor. Stairs connect a ground floor workspace with the double-storied studio. Skilfully positioned wall panels conceal the lift, kitchen, dressing room and toilets, enhancing the homely effect. This restrained concept continues on the upper floor. Coming out onto the gallery, the visitor sees only four doors. Behind the doors are the bedrooms and guest rooms. The house’s inhabitants access the bathrooms through these rooms or through doors hidden in the wall panelling. The most spectacular aspect of this stylish villa is not its size, but the play of light and proportions, which have been well thought out to the minutest detail. Its architecture, in a classic Modernist style, continues throughout the electrical installation, of which JUNG’s Facility Pilot Server is the control centre. Two touch panels on the ground floor and upper floor can be used to switch lights on and off, dim lights, and regulate the louvers in the house. Users can do all this conveniently via iPad, wherever they are. 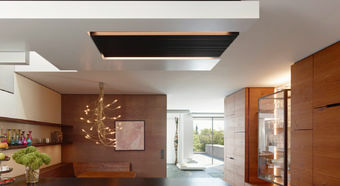 Room controllers in individual rooms regulate their temperature, lighting and shade. All the visible elements are in JUNG’s classic LS 990 switch design in anthracite. With its classic, clean form, it harmonises perfectly with the house’s modern interior.